← While Being a Parent by Eddie Marie Durham Book Blast – Win a $25 Amazon Gift Card! 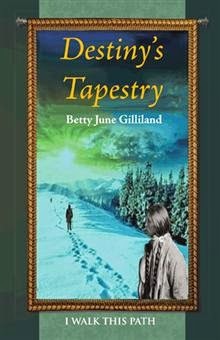 Destiny’s Tapestry I Walk This Path by Betty June Gilliland Book Blast – Win a $25 Amazon Gift Card! On a stormy night, as a hurricane raced up the Gulf Coast and created havoc in its path, Betty Gilliland was born on a corn shuck mattress in a barn at the foot of Sand Mountain. As soon as the midwife wrapped her in a blanket and gently laid her in a cow manger, Gilliland began a journey through life that would eventually test her spirit, courage, and, most of all, her power to forgive. Gilliland begins by chronicling her growing up years during a challenging time in America’s history. Her father was drafted into the war and then abandoned his family, leaving Gilliland and her mother to eke out a life for themselves in their tiny cabin, surviving on a diet of wild greens, nuts, and roots. As she weaves through the threads of her life’s tapestry, Gilliland recalls the challenges she confronted during her difficult coming-of-age journey as she suffered through hardships, physical abuse, emotional abandonment, and her own self-destructive behavior. Yet through it all, she never lost the faith. What’s more, she used that faith to begin building a new life and to discover her roots. Destiny’s Tapestry shares one woman’s poignant memories of moving from the darkness of abuse into the light of healing. Betty is giving away a $25 Gift Card!